A Pakistani woman is being held on suspicion of killing her husband, cutting him up and trying to cook the pieces, Karachi police said today Friday Nov 25. Zainab Bibi, 32, was arrested in connection with the murder Tuesday of her husband Ahmad Abbas, police said. Her 22-year-old nephew, Zaheer Ahmed, is accused of helping Bibi stab Abbas to death and carve his body into small pieces. Police said she wanted to cook her husband's body parts so she could dispose of them without being caught. Neighbors raised the alert when they detected a foul odor in the neighborhood, police said. "I killed my husband before he dared to touch my daughter," she told ARY News. God please save us from evil that wear clothes and pretend to be humans in disguise. Trust me, paskintan is one of the most dangerous country in the world.their women suffer alot. i dont blame the woman for what she did cos i ve seen different pakistan and afghanistan (women) with halv nose, ear and leg. some them pour acid on their wives cos she didnt cook or she didnt let the man sleep with his daughter. May God help us. linda how are you doing? in my opinion, that isn't enough reason to take another man's life!! the best she could have done is leave the man, run away or something! killing him isnt justified at alll! but this thing na serious matter ooo. how papa go wan sleep wit him own pikin?? heard on Sharing Life Issues ( Inspiration FM 92.3) last night of soem married women who confessed to being molested sexually by their fathers at a tender age. Men!!! haba!!! prostitutes don finish for market? abi una wives no dey agin ni? why e be sey na d pikin wey una borm na im una see to chuk??? TUFIAKWA!! i'll castrate (not kill) such man before he dares do dat to my child!! BACK TO THE STORY! she could be lying sha! as d dead man no dey to talk wetin happen, na any story she fit sell to d press. hmmm, plenty plenty signs of the end time!!! she's very stupid,let er cook him n eat his body as well,don't knw wt dis world is turning into,wud she nt ave reported 2 d police of her husband's intention rader dan killing him?God help us. The world is coming to an end,if a woman could ve this kind of mind,then what else re we talking about.But then,the woman will ve her head examined. If care is not taken, there'll soon be a law for fathers to marry their daughters since anything goes nowadays!!! Have you heard of bride burning or dowry death or the things women pass thru in some parts of Asia? Please veronica and the rest of you, if you don't know what it feels like to be a woman in a country with sharia law don't stand in your own world judging others. Who told you the man was her choice to start with? Where do you want her to run to? the parents that married her off? As for you Atobatele i bet you're one of those that start attacking their daughters instead of protecting them from sexual harrasment because you want to keep you're MARITAL STATUS mschewwww. Animal in human skin. She's a cannibal I guess or she's leavin in anoda world entirely. U kno what I mean? Awon people ti n play game ninu brain e.
Dis world sef,men are goat.God 4 bid bad thing. Na wa o. 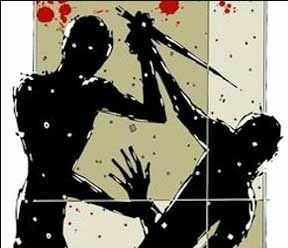 Woman kill man! Woman say man wan sleep with his own daughter! Man no dey to talk him own side of the story! Bloggers believe woman and start abusing all men! U na no get brothers and fathers? If a man does wrong, he is labelled "animal", if it's a woman; we make "situation" excuse. I beg, make we leave the circumstance that we are not sure of. she has become an ALLEDGED MURDERER and let the case go to court where judges will determine her fate.